Religion > Indian Religions > Buddhism > Societies, councils, associations, clubs, etc. The Four Noble Truths provides a strong step toward a solid foundation in Buddhist thought. 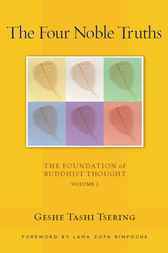 This volume is the first of six, and offers a complete presentation of the Buddha's seminal Four Noble Truths which summarize the fundamentals of the Buddhist worldview. Indeed, they are an essential framework for understanding all of the other teachings of the Buddha. The Four Noble Truths explores central tenants of Buddhist philosophy in direct, non-sectarian approach, interweaving the insights of the Theravadan and Mahayana views (Buddhism's two major streams). This unique book was developed by Geshe Tashi Tsering, a Tibetan scholar renowned for his ability to render Buddhist teachings accessible and relevant to everyday life.